It almost seems senseless to share these pictures now because it has been three weeks since then and she has changed - both in her way of going and in her weight, in my estimation - but I will share anyways - because there needs to be some photos "for posterity" when she looks so much better later down the road. 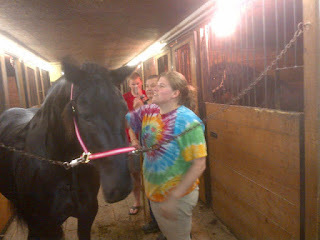 These photos were taken by my sister on June 9th at our new barn. 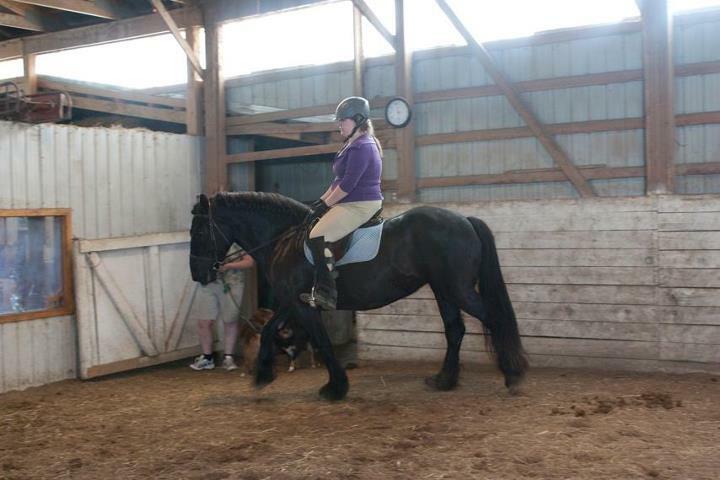 It was her second or third ride since she landed, and the first time she had really been worked since last year. 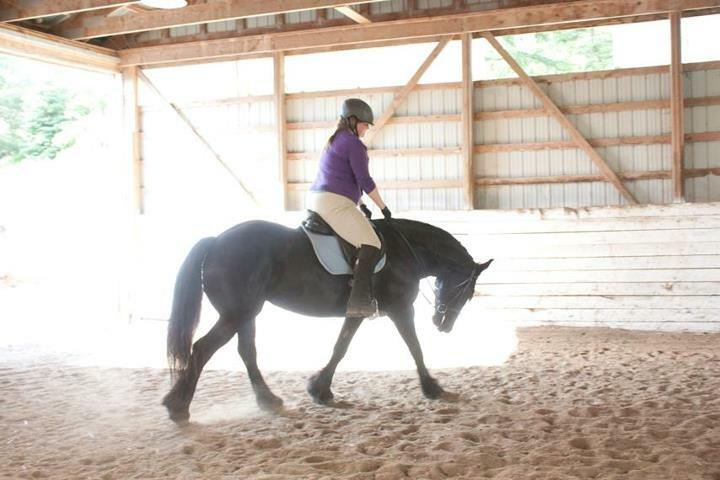 If I'm truly honest, though she's had several rides and been "under saddle" for three years, she has never really been put to work until now, and she is doing very well. She is definitely rising to the occasion and I am excited to see what she can accomplish! So, without further ado, the "before" pictures! Little bit stiff yet. She is also scared of this door, I don't know why. She always seems surprised at the things she can see out of it. God love my weird-o pony. Finally starts to relax down a little. I think this is my favourite shot. She does need to bring her head up some but I love the give here. Feeling a bit slouchy here! This really accentuates her cresty neck - she doesn't have any topline to speak of either at the moment so she is looking a bit like a big "S" but I think that this will come with time and fitness! Happy long weekend to those who are getting one this weekend! Hope you get a chance to enjoy your horses! I have a bunch of entries that I keep STARTING to write or getting the idea to write and then not being able to write them. This week has been wild and wooly, and I have sat down with the intention to share many a time... 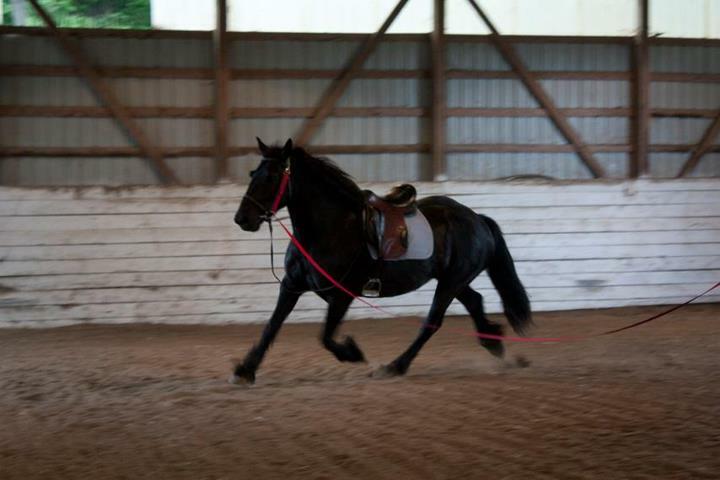 I even have riding pictures that are nearly three weeks old! But I had to post about this. I just got a pair of brand new TuffRider paddock boots, and I didn't pay a cent for them. Not even shipping! This entry is SORT OF "not horse related", but I wanted to share. I know I have mentioned it on the FB fanpage before, but I use a website called "SwagBucks" (full disclosure, if you click on that link, it is my referral link and I will get matching points for your first 1000 points worth of search wins - feel free not to use the referral link if you prefer.). It is a pretty neat site and I have been able to get about $135 worth of Amazon Gift Cards from the site. The easiest way to earn points on the site is to use their search engine (comparable to Google) - I use it for EVERYTHING, instead of typing in web addresses these days. Three or four times per day, depending on how much you use it, you could be awarded "SB" for your search - I just won 59. It takes 450 "SB" to earn a $5 Amazon Gift Card. The thing I loved the best about Swag Bucks was that ability to use it even in Canada. Lord knows enough of the "freebie" and survey sites are US only. I was impressed that I was able to accumulate so much with minimal effort here in Canada. There are lots of US citizens in the community that use Swag Bucks to help make ends meet - they offer coupons in the US (when you use them, you get a SB credit! ), you can do surveys, viewing videos (basically ads) earns you SBs. Basically, there are tons of options, and you can redeem your SBs for anything from Amazon or Paypal gift cards to Keurig coffee makers in the "Swag Store". 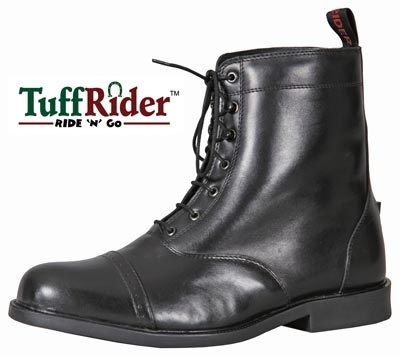 I didn't think I would be able to use this for ANYTHING horse related... until I realized that Amazon now does third party sellers, and you can order from Horseloverz items and even direct Tuffrider products with Amazon gift cards! The possibilities are endless! I didn't get paid for this advertisement, either. I just think it is NEAT and a lot of people don't realize it is out there! 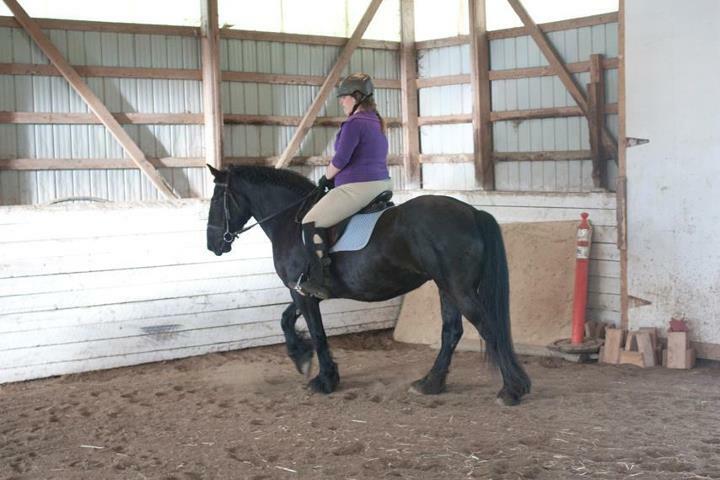 As an aside for those who are wondering - Bronwyn is doing fantastically at the new boarding barn! She has settled in, is turned out with a friesian mare and gelding (I am hoping their friesian-ness will rub off on her! :)) and seems to fit right in! 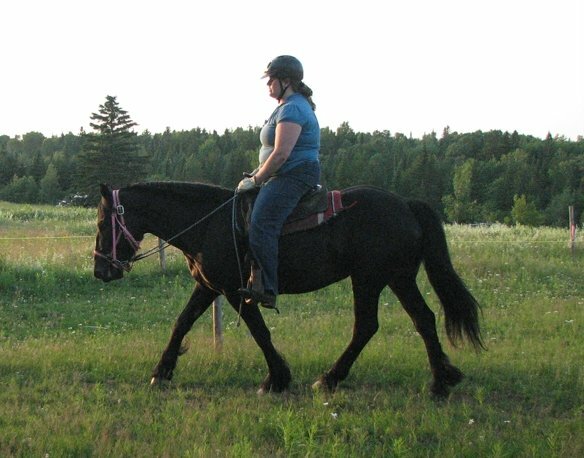 I stopped by on Tuesday night and gave her a good grooming and longed her a little bit - then braved up and rode. She was as good as I could expect considering her inexperience in indoor arenas - she eventually settled some and I considered it a success! I wish that last night I had had my camera with me when I first arrived at the barn and saw her hanging her head over the gate of her paddock with Jesse, her new boyfriend. She was NOT wearing a halter. Remembering that I had specifically asked that her halter stay on because she is known for being a little difficult to halter/catch with new people (or so I thought, anyways, apparently she has proven otherwise! ), I told another girl at the barn that I was sure that it was in a pile of poop and that she had removed it herself. 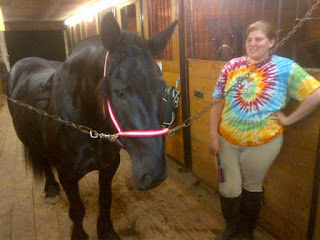 It was, afterall, a brand new halter just put on her for the first time on Sunday when I moved her. I scanned the paddock and eventually found it, sure enough, stomped into a pile of poop under one of their shade trees. She let me walk up and put it on her. I had a lesson on the big Friesian mare and had hardly enough energy to ride her (I have begun a running program this week... stupid. 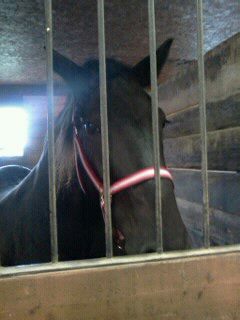 LOL), so I didn't ride Bronwyn but did give her a good grooming and turn her back out. I have to say that this has been nothing but good for her so far - putting the halter on, catching her in the pasture, letting the BO (a man (strike 1) who is a stranger (strike 2)) work around/handle her, hardly bats an eye when the dogs at the barn are making noise (dogs were previously a non-negotiable "absolutely NOT!"). I think the busy-ness of the barn will ultimately help a lot of the spooks she still has, and am really looking forward to seeing further positive improvements in her disposition as we work here! 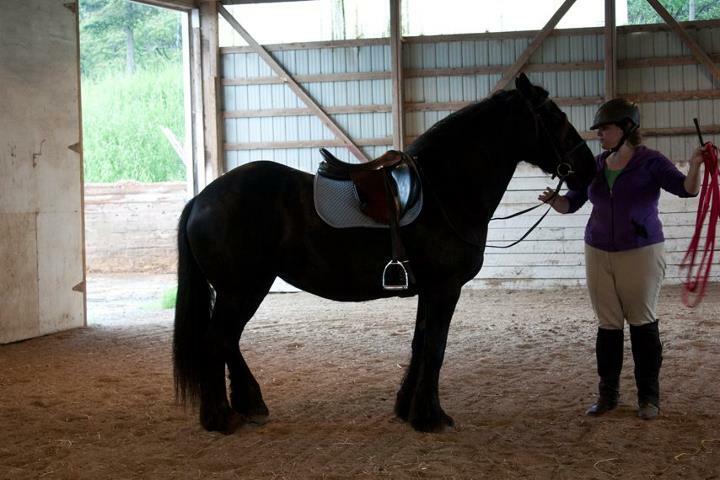 In the process of measuring her - I guess she sticked at 15.2hh which surprised the crap out of me! Looking pretty pleased with my mane-brushing work! My Friday Favourite (and I know I am not consistent with these, no matter how much I promise I will be!) today is the group Riders 4 Helmets. Saturday, June 9th, is International Helmet Awareness Day. This next part won't make me popular, I am sure... I do believe that it is your right to choose not to wear one, I just don't know why you would choose not to. I have heard a lot of reasons why people don't wear them, and if I am honest, I don't think any of them are good enough. There are people out there who will aggressively say that you're being overcautious and going to get hurt if you wear one (the last time I checked, people don't get hurt more often when they wear seatbelts in a car...)... others that say they don't like them and they feel uncomfortable (with the range of helmetmakers out there, you can find something that will fit, be comfortable AND be in your price range without a whole lot of difficulty), some "can't afford" to buy a helmet (if you can afford your horse, you can afford your helmet - you can get them as inexpensive as $40!). With that said, I don't judge anyone who chooses not to wear a helmet - that, again, is your right to choose. I don't, however, believe that you should let your children ride without a helmet, even if the child "chooses" not to - but that is a whole other kettle of fish. 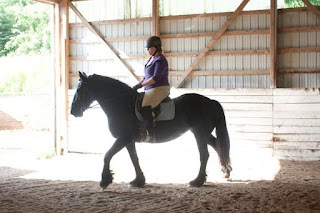 Olympic dressage rider Courtney King-Dye suffered traumatic brain injury (TBI) in March of 2010 when a horse she was schooling tripped and fell. She was not wearing a helmet at the time. King-Dye’s accident inspired the creation of Riders4Helmets. The goal of the campaign is to educate equestrians about the benefits of wearing a certified, properly fitting and secured helmet. They are doing some great stuff for helmet awareness out there. Life is dangerous enough as it is, why tempt fate? I mostly kept this under wraps because I kind of knew that if I talked too much about it, I would jinx it - because that is pretty much the story of my life - but I moved Bronwyn on Sunday to the barn that I have been riding at since February. She is now 15 minutes away from me instead of 45 minutes, but it was bittersweet for me. 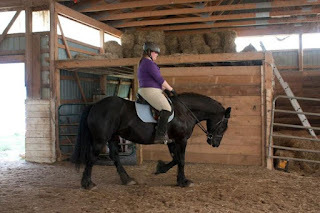 On the one hand, I am super excited to be able to get out there more than once a week or once every two weeks to ride - I am right now aiming for three rides a week with someone else working her on the longe for me once or twice a week. On the other hand, when I go home to visit my family, she won't be there for me to hang out with. The plus side of this is that the only horse that I will have there to ride will be Rex and maybe I will get some more rides on him so that he can be that reliable, broke horse that I can just hop on and go. Overall, I waffled back and forth a lot on the decision to move her, and ultimately, the decision is that it can't possibly be a bad experience for either one of us. She will have the opportunity to be handled by more than just me, which is never a bad idea - I will get more riding in. It's win-win-win. She, of course, hopped on the trailer like nothing, even after not having been on a trailer for probably a year or so (we just didn't go anywhere last year!). Trailered well, but sweat a little bit, which I kind of expected. 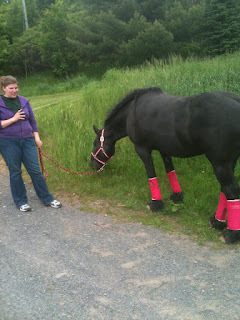 When she got off the trailer, I made the mistake of standing on the other side of her when dad closed the trailer ramp and now I have a nice big swollen purple foot (and I am supposed to start the Couch 2 5K program tonight!) 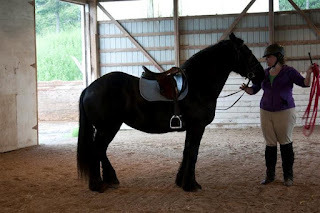 - snorted a lot at walking into the barn - horses on each side is something a little new for her - and into her box right next to Lolya, the mare I ride in my lessons and across from Quantum, the friesian stallion that also lives there. I longed her a bit after she had been settled in some and she relaxed a little bit. It was hard for me to relinquish control, though. 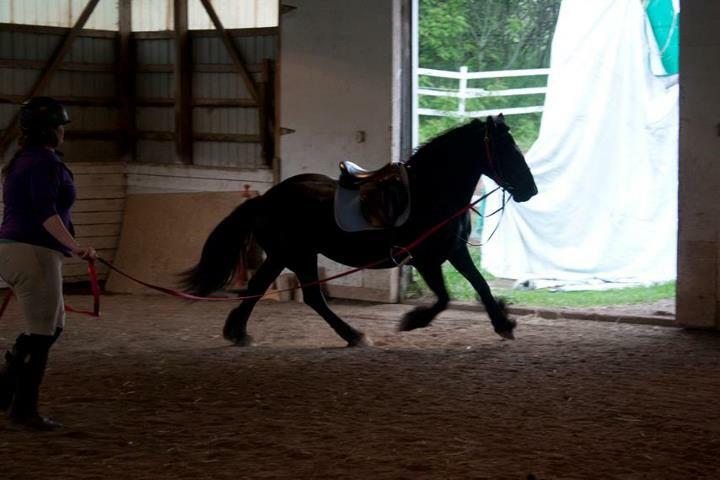 Myself or my family (mostly my dad) have been the sole caretakers of any of my horses for pretty much my entire life. I have never boarded before. My biggest fear is that she will be difficult and cause trouble. She can be bossy in the pasture, she can be annoyingly spooky, hard to catch in the pasture, hard to halter. I had to nearly be pushed out of the barn by the BO and my coach when it was time to go, as I kept reminding them of her little peculiarities and told her to "be good, and don't hurt anybody!". I've had several reassuring messages from friends and I think that I know, in the deep part of my heart that sometimes gets overrode by my constant worrying, that she will be just fine, and she will flourish with all the handling and attention.